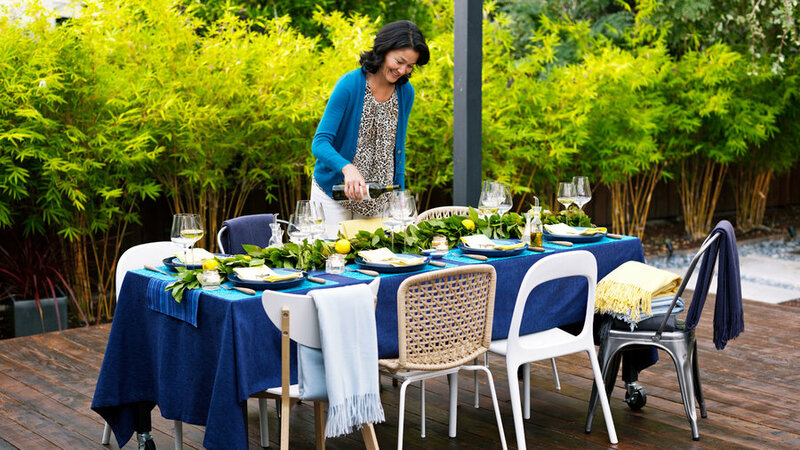 Even if it’s too brisk for an entire open-air dinner, you can still start the party alfresco. 1. 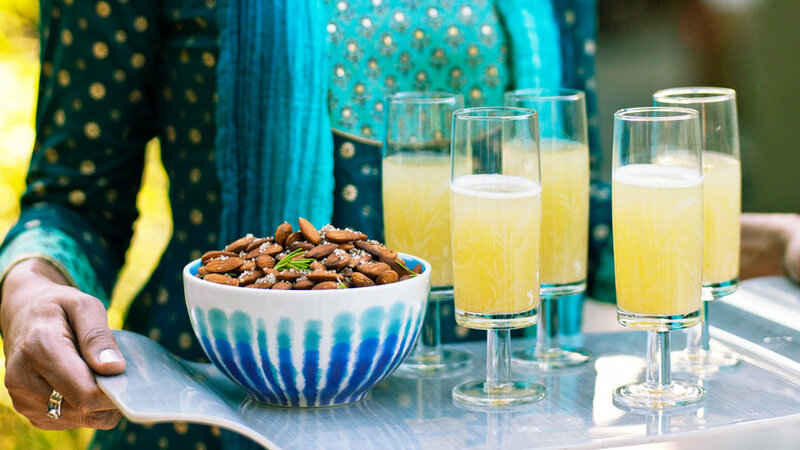 Quick spritzer: Instead of the expected cranberry, surprise your guests with pear: Fill a glass halfway with pear nectar (we like Kern’s) and top it with your favorite prosecco. 2. Easy eats: Make your own toasted herbed almonds: Combine 2 cups raw almonds, 2 tbsp. sea salt, 1 tbsp. finely minced rosemary, and 2 tsp. olive oil. Roast on a sheet pan for 10 to 12 minutes at 350°. Get it: Streak-Dyed bowls by Urban Outfitters ($8 each; ). 3. 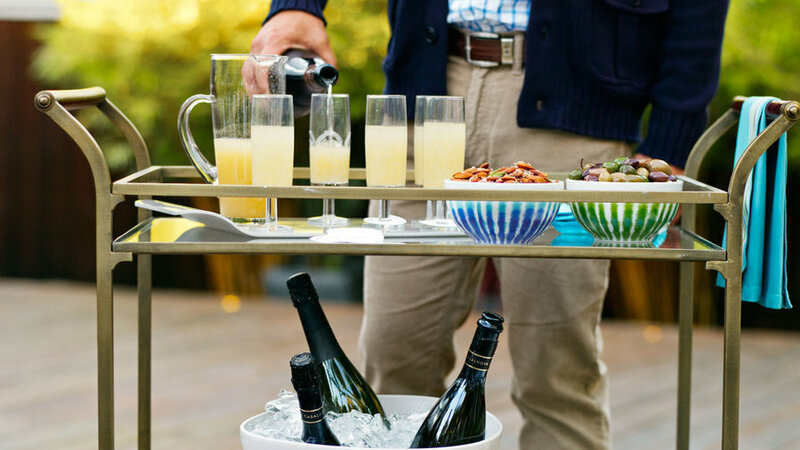 Hands-free hosting: Set up an aperitif and appetizer cart with pour-your-own cocktails and grabbable nibbles. 4. Creative cooler: Keep the bubbly on ice in a garden pot. Get it: Bigarra planter by Ikea ($25; ). 5. DIY drink IDs: With a pencil, trace the base of each cocktail glass onto heavy paper stock (a good use for old calendar pages or catalog covers). Next, use a dime to trace a circle within your circle, then cut around both and snip across one side of the “doughnut.” Write a guest’s name on each. 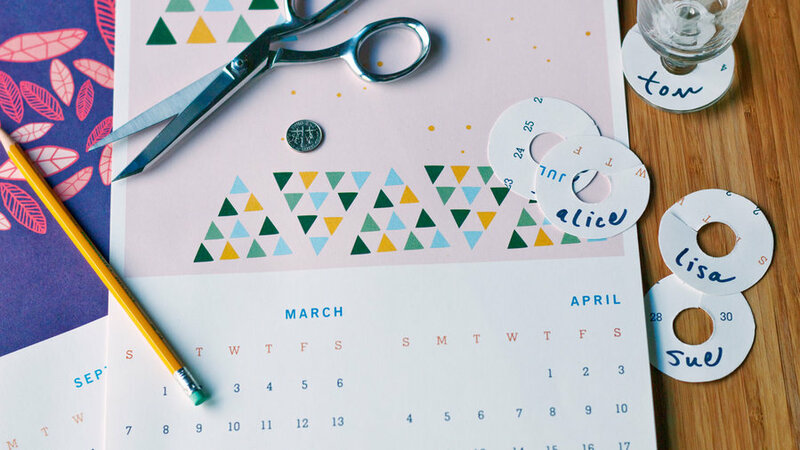 Get it: Good on Paper calendar by Lisa Wong Jackson ($20; ). 6. Interactive ambience: Set up a record player and a selection of albums—ask guests to bring their favorites and encourage all to play DJ. An iPod boom box works too. Get it: USB turntable by Crosley ($131; ). If your climate is temperate enough, go ahead—move the dinner table outside. 7. Garden centerpiece: Keep it low and give the gourds a rest. Make a casual garland with clippings from your own yard—ours was inspired by one on the blog . 8. Versatile furniture: Mix indoor dining chairs with outdoor ones as the length of your guest list grows. 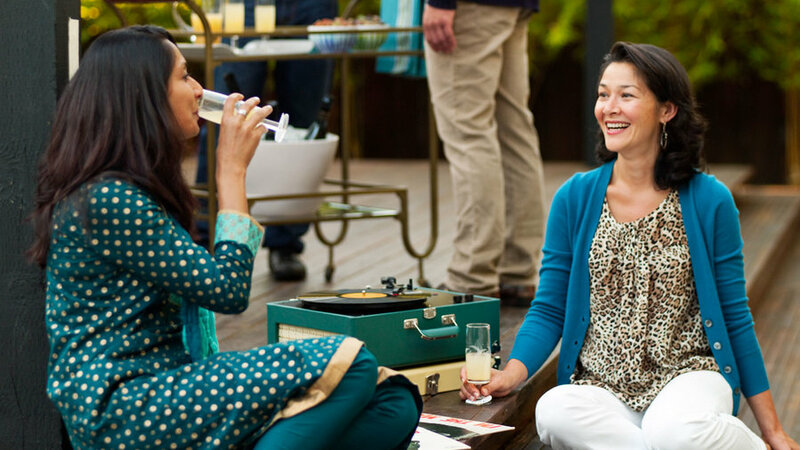 We used a table with wheels to make it even easier to bring the party outside. Get it: Nandor ($70), Nordmyra ($40), and Urban ($40) chairs by . Egg salt & pepper cellars by Roost ($44/pair; available at Sallie Mac, 707/937-5357). Cruets by Roost ($30/set of 2; available at ). 9. Just in case: Draped throws on the backs of dining chairs offer warmth-as-needed for guests—and another punch of color. Get it: 1934 metal chairs by ($245). Cashmere throws by ($298 each). 10. In the frame: With a canopy, any outdoor area can feel like an outdoor room. Here, a retractable sailcloth awning floats overhead like clouds. Get it: Awning by (made-to-order; from $300). 11. Crisp palette: Who says Thanksgiving decor has to be dictated by the colors of turkey feathers? Try hues inspired by winter citrus and the blues of the Pacific. 12. Place settings: Mark each table setting with the guest’s initials. 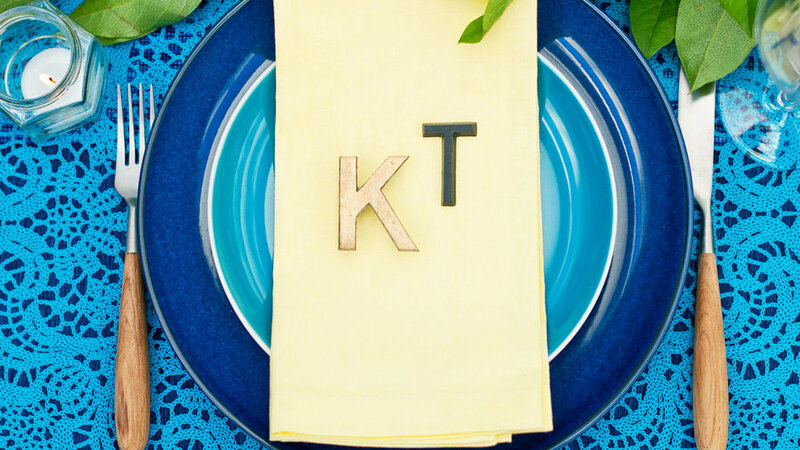 These vintage letters do double-duty as napkin weights and party favors. 13. Everything is illuminated: Tealights in jam jars keep each table setting visible as the sun goes down. 14. Home on the range: The genius of dining in your own backyard is that your kitchen is just a skip away. Serve food buffet-style indoors—it can stay warm on the stovetop. Get it: Letters from (from $6 each). Max Teal salad plates by ($5). Coast dinner plate by Crate and Barrel ($6). Sky doily placemat by Urban Outfitters ($3). Wrap things up with round-the-campfire coziness under the stars. 15. Bring in the light: Go beyond the ho-hum twinkle of traditional Christmas tree strands. We love these colorful porcelain shades, which shed a soft glow, like mini pendant lamps. 16. 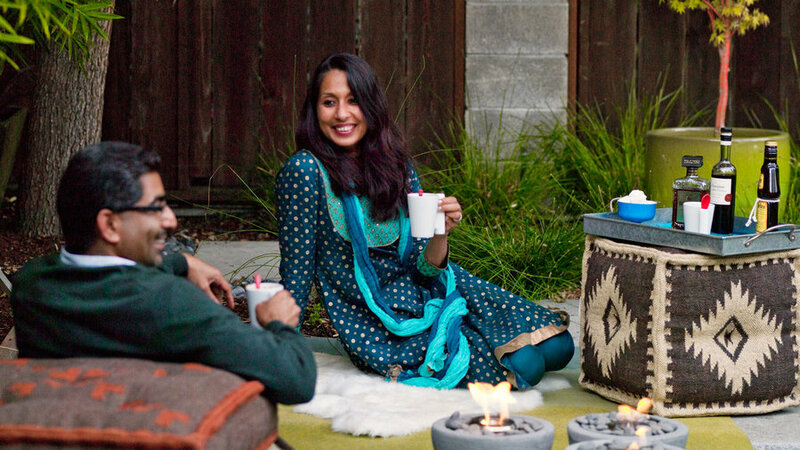 Create the space: Turn a backyard corner into a cozy nook with a colorful rug to define the area. 17. Warm it up: Cluster eco-friendly mini fire bowls for a little heat without all the smoke. 18. Inside out: Bring out your favorite cushions or blankets, or buy a few inexpensive ones that you can leave outside. Get it: Porcelain Disk string lights in Storm by ($164/strand of 10). Pondicherry cube by Roost ($250; available at Lawson-Fenning, 323/660-1500). Mini River Rock fire bowls by ($49 each; 10-in. diameter, 51/2 in. high). Ombré rug by CB2 ($249; 5 by 8 ft.). Pondicherry floor pillows by Roost ($195 each; available at Lawson-Fenning). 19. And that nightcap? 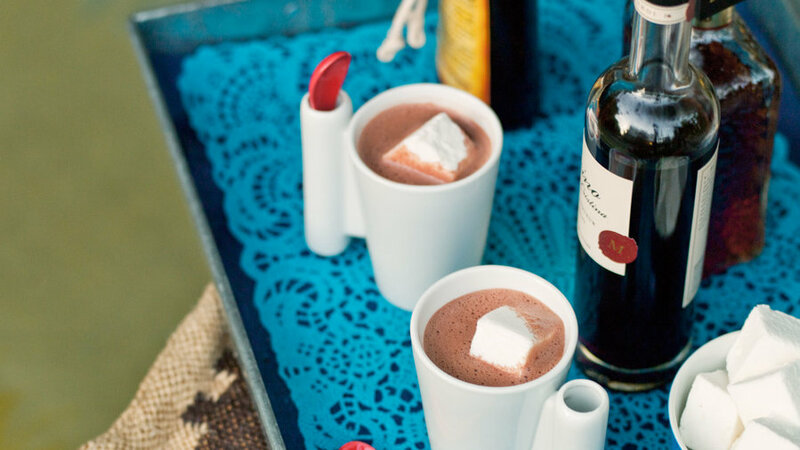 Brew some dark hot chocolate and serve it on a tray with add-your-own nut liqueurs and gourmet marshmallows. Our favorite combo: Grand Cacao Drinking Chocolate ($9) with walnut liqueur (about $30). Get it: Spoon coffee mugs by ($16/set of 4). 20. 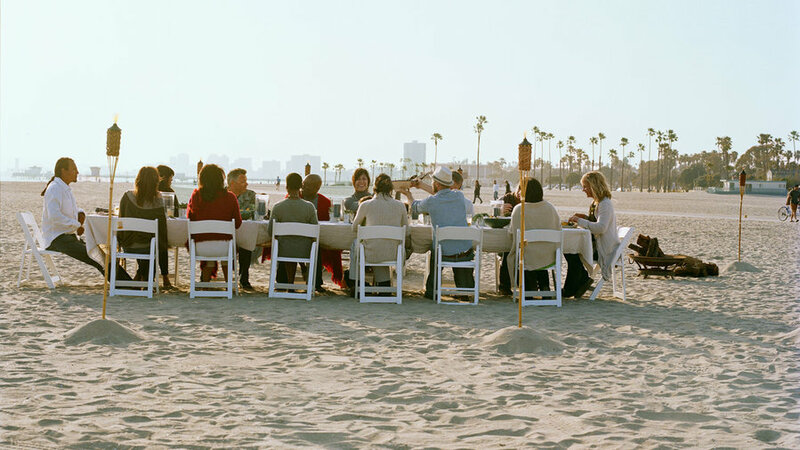 Stretch your outdoor dining adventure: Try taking the celebration to the shore. To see how, click on Thanksgiving on the Beach.